When we asked our 6-year-old what kind of Valentine she wanted to give her classmates this year, bubbles was her immediate response. Who wouldn’t love getting bubbles in their Valentine’s Box this year? 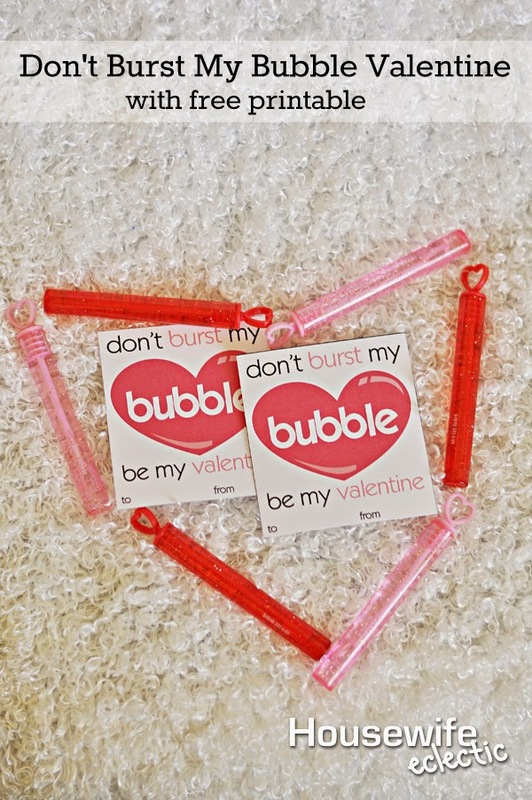 Just add bubbles to this cute printable and you have a great valentine. I found packages of 18 bubble tubes at Michaels for about $1.50. I went with the smaller vials so that there is less potential for mess in the classroom. I am sure the teacher is going to be thrilled to see bubbles, but the kids will be happy, right? You can find the download of this printable at the end of the post. Please keep in mind that this Valentine is for personal use only and if you want to share the Valentine feel free to do so, but direct people to this post and not the download directly. You can find the rest of my free Valentines here. That is such a cute idea. Who wouldn't love that? That is such a cute idea! It is so easy and affordable. I prefer to send my kids with candy-free Valentines. There's so much sugar going around, it's nice to have something a little different. The kids would adore these bubbles! Those do sound like fun and maybe if you and your daughter are lucky–the teacher will join in on the fun! Like you said-who does not like bubbles! I think these are the absolute cutest!! This is such a cute idea. I bet my daughter would love to make these. So very cute. That truly is a cute idea! Kids always love bubbles, and so do I.
Ha ha! So punny and cute! Great for the kiddos.